Whether you are playing sport or cheering on from the sideline it can get pretty hot when you’re out in the sun for a prolonged period of time. An umbrella is a great way to give yourself some person shade and protect yourself from the sun’s ultraviolet rays. See! Multiple reasons why you should add an umbrella to your list of sun protection protection items. 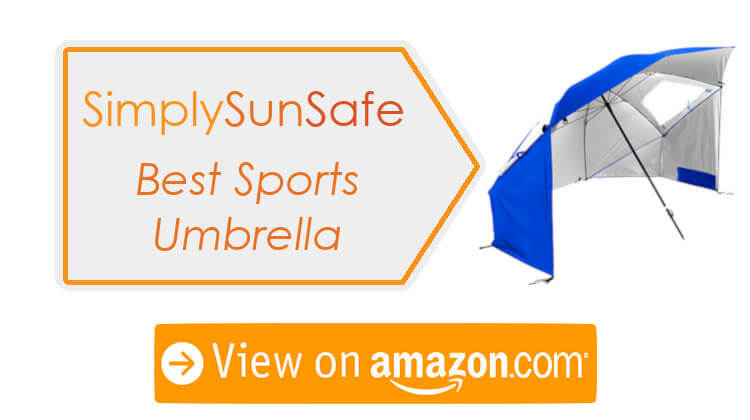 After thorough research into requirements for sports umbrellas to be effective when used for sun protection, SimplySunSafe recommends Sport-Brella Super-Brella as the best umbrella for sports for sun protection. 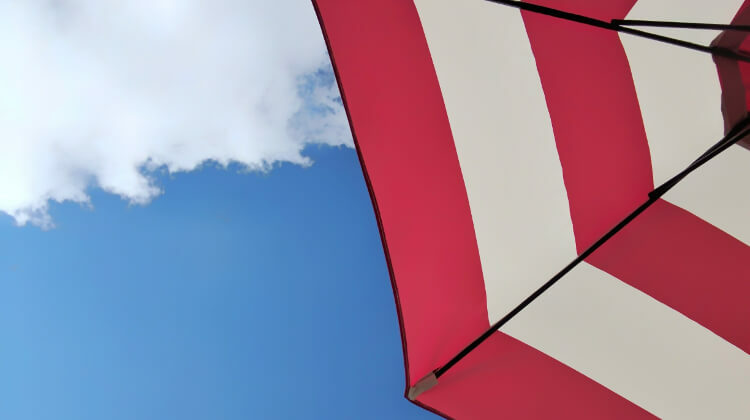 Read on for a detailed buyer’s guide, comparison table, and in-depth reviews of the top 5 sports umbrellas for protecting you from the sun. Umbrellas are available in a huge range of sizes and are measured across the arc or the curve. A personal use umbrella will measure somewhere in the range of 35 to 50 inches. A larger umbrella can be anywhere up to 68 inches. Today we are also going to check out some even larger umbrellas which reach up to 8 feet!! You will want to take into account the space you have available and how many people you want to cover. Are you providing enough shade for yourself or a small family of cheerleaders? While you are probably used to seeing your usual hand held umbrellas, sports umbrellas can be a little different. After all, you need your hands to cheer on your favorite team. Today we are going to check out some umbrellas that will clip to your chair to provide you a personal area of adjustable shade and larger umbrellas that are mounted using the ground to provide shade for multiple people. Now this one does not assist with windy conditions but it important for protecting you from the sun. UPF stands for Ultraviolet Protection Factor. This number gives you a tool on measuring how much ultraviolet rays may reach your skin and cause sun damage. If you’re after a small personal option the weight probably won’t play too much of a part in your search. However, if you’re looking for a larger sports umbrella you will want to make sure that it’s not so heavy that you need an army to carry it, but not so light that it’s flimsy and ineffective. No need to think you can’t have some fun while protecting yourself from the sun. Umbrellas come in all different colors and patterns. The best color for sun protection is silver as it assists in reflecting UV rays away from you. But if you have a great UPF rated umbrella you’re always going to protected so let yourself have some fun or stand out from the crowd with something a bit different. Super important in windy conditions, ventilation assists with letting air flow through your umbrella and also helps keep you cool. This is how you open and close your umbrella! 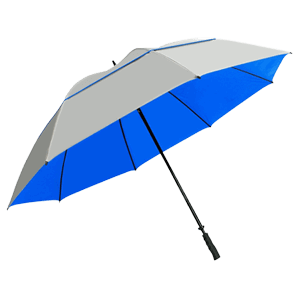 Umbrellas come as automatic opening which open (and sometimes close) with one press of a button. Others will require you to manually push them open or assemble them yourself. You want to get a quality umbrella for the best price possible. This article has you covered no matter how big or small your budget. Enter the Super-Brella! I love the name of this one. It’s a great option for the whole family to sit under to cheer on your friends and family. Or for the team to sit under at half-time. This is my pick for the best sports umbrella. The Sport-Brella Super-Brella protects you from all the elements. Rain or shine – you’re covered. 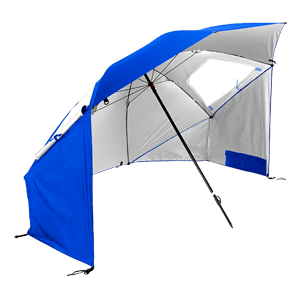 Super fast and easy to set up it features a large UPF 50 rated canopy. A silver undercoating also helps keep you cool. The canopy has side panels to assist protection against strong winds. Wind vents and zippered windows also assist in creating a great wind-resistant option! When erected the umbrella is a whopping 8 feet wide and folds down to 54×4 inches and weighs in at 9 pounds. It’s not hard to carry along with everything else you need to carry to sporting matches! There are two colors to choose from so not too much variety there. Obviously due to its size this umbrella is in a higher price range but well worth it if you are after something to provide coverage for a small army. The Sport-Brella Versa-Brella is an innovative and well-designed umbrella that allows you to adapt your golf carts, sports chair, or esky into a shade bearing structure. Instead of featuring the usual handle, the Sport-Brella features a universal clamp that can be attached to almost anything. It has a 4 way, 360 degree swivel so you can manipulate this umbrella to keep you covered from an angle. There are two sizes to choose from, regular and extra large, and 3 different colors. The regular size reaches a span of 40 by 42 inches and the larger option is 44 by 44 inches. Both of these sizes are ideal for one person and also are manual opening. Due to the design of this umbrella it isn’t great for rain so keep this one for the UV rays which you are super protected against with the UPF 50 rated fabric. A great option for those watching a kids soccer game or walking around the golf course. The Versa-Brella is also super budget friendly. 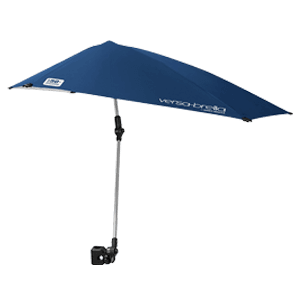 The SunTek Wind Cheater is a great option for those looking for an umbrella for both rain and sun protection. It is best suited to golfers and has a universal sized ergonomic handle that will fit most golf carts. It’s a huge 68 inches which will fit two people comfortably. The inner mechanics are crafted from quality fibreglass giving you a super sturdy build. The 100% nylon canopy has a UPF rating of 50 giving you the best sun protection available. Not only crafted for rain, SunTek also designed this umbrella with sun protection in mind. The external color has a silver coating to reflect away UV rays to help keep you cool. The SunTek Wind Cheater gets its name from the innovative vortec venting system which features a double canopy that prevents the canopy from inverting during high winds. Available in 4 different internal colors depending on your taste. Each umbrella also comes with a matching cover for protection. A mid range budget option that will suit everybody. Get SunTek Wind Cheater Now! This is another innovative clamp option to attach to whatever you may need it to! Wheelchairs, eskys, prams, even stainless steel seats you get find at your local sporting ground. The clamp on this one is a ‘C’ shape clamp so is able to attach to almost anything! 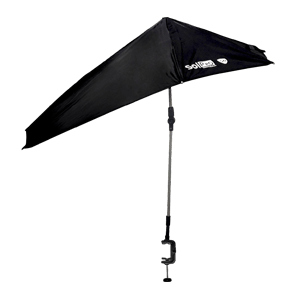 The SolPro Clamp-On Umbrella has a 360 degree swivel and an adjustable 4-way clamp. A push button hinge makes for easy and fast adjusting to get your shade right where you need it. A nice and large canopy of 30 inches by 40 inches will provide enough shade for yourself. The canopy does not have an official UPF rating but claims to block 99.5% of UV rays. The silver lining assists in repelling the sun and helps with keeping you cool. Due to the shape of this umbrella it isn’t too great for rain protection! Available in 3 colors (black, red and blue) and at a great low price, it’s lightweight so it won’t be a hassle to carry! If you are after a sports umbrella to attach to your favorite sun chair this one is a great choice! Get SolPro Clamp-On Umbrella Now! Another great option for those looking for a bit more than just personal protection. 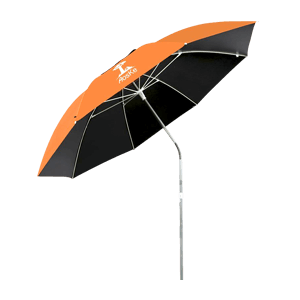 The AosKe Portable Sun Umbrella is designed to be erected by securely inserting the 3-pronged anchor into the ground. Its canopy height of 59 inches means that you are then able to sit comfortably on chairs underneath to seek shade when watching your favorite sports. No official UPF rating but it does claim to block 99.9% of UVA and UVB rays. A universal metal turn head means it’s easy to manipulate the canopy to ensure you’re well protected from the sun. The AosKe Portable Sun Shade also features a double layered canopy to help with cooling you down in the heat! Lightweight aluminium poles give you a strong and sturdy structure. Even though this umbrella is sizeable when up, it folds down to a compact size that is easy enough to carry in its specially designed carry bag. The size and design of this one means it’s a higher price than a personal umbrella but a great addition to the family if you are after more than personal protection. Get AosKe Portable Sun Shade Now! This guide is for everyone on the hunt for a sports umbrella. This article has given you some insight and features to keep your eyes peeled for when look for the best sports umbrella. There are various types out there so hopefully you have found one that meets your needs! SimplySunSafe recommends Sport-Brella Super-Brella, but with umbrellas it all depends on how much coverage you want and how you want to use it. There is no one size fits all. I always like to learn new things and hear about new products from other people. So if you end up purchasing one of the umbrellas i have recommended today or find another one you think should have made the list, please share it in the comments. I will take the time to check it out and do some additional research.